Jingdezhen kilns, Jiangxi province, China, Blue-and-white large moon flask, 19th century, Porcelain with underglaze blue, The Suzanne and Alex Rosenkrantz Collection of Asian Art. Few color combinations are more pleasing to the eye than blue and white. For more than a thousand years, potters across Asia have created strikingly handsome ceramics by using cobalt to create deep blue tones. In China, blue first appeared as an accent color in splash-glazed wares of the Tang dynasty (618–907). For centuries, the Chinese used blue sparingly, as their principal source for cobalt ore lay on the far side of the deserts of Central Asia, in northeastern Iran. 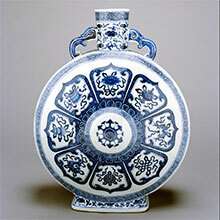 It was not until the Ming dynasty (1368–1644) that the Chinese found domestic sources of cobalt and discovered that it was the perfect decoration for porcelain. The magnificent imperial blue-and-white wares of the early Ming are today regarded as without equal in the history of world ceramics, while the commercial wares of the same period charm us with their casual, rapidly executed designs. From China, the use of cobalt for underglaze blue painting spread far and wide, from Korea, Japan, and Vietnam to Persia and Ottoman Turkey. This dossier presentation draws on the Museum’s holdings and private collections to explore the fascinating regional and chronological variety of Asian cobalt-glazed ceramics.